Imagine for a moment that air was as visible as water. As every car passed, you would be able to see the swirls and whirls of air disturbed by its passage. Some cars would drag behind them an enormous wake, larger even than the frontal area of the car. Others would have only a small area of disturbed air trailing them, these cars slipping easily through the air. If air could be seen, you can be certain that car aerodynamics would have never gone out of fashion – after all, boats with flat fronts are pretty rare! There are two factors that decide how easily a car can pass through air. The most commonly quoted factor is Cd, or coefficient of drag. A flat dinner plate moved face-first through air has a Cd of about 1.1. More slippery shapes have a lower Cd, such as the 0.45 Cd of a sphere. Cross-sectional area depends on how big the car is, but the Cd is influenced by how the air flows over the car. The total drag for a given speed is proportional to Cd multiplied by the frontal cross-section, a figure termed CdA. Note that the larger the car, the easier it is for its designers to achieve a low Cd – but the CdA figure is the one that is more important. Incidentally, many manufacturers’ Cd figures are quite rubbery - often, cars are retrospectively given a poorer Cd figure after the next model is released. 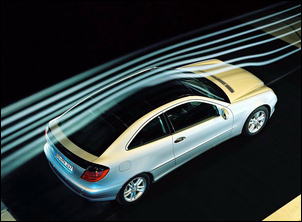 If you imagine air being a series of thin layers, when the airflow remains in layers (laminar) as it passes over the car, the drag acting on the body is low. Anything that causes the laminar flow of air to separate from the body - and so become turbulent - causes drag. The ultimate low-drag shape is a teardrop with its hemispherical front end and long, tapering tail. Theoretically, a tear drop shape has a Cd of only 0.05! Note that it’s not the pointy end that faces forward, but the rounded end which goes first. It’s worth thinking about why a tear-drop shape has such a low drag co-efficient. When the smoothly-curved front end of the teardrop shape meets the air, the air is gently deflected around it, staying attached to the object in attached flow. The long tail of the drop allows the flows to rejoin with only very minor turbulence. If the air had not remained attached to the shape (because of a sudden step in the shape, for example), the flow would have become turbulent at that point. However, it is obviously impractical to have a car shaped like a teardrop. 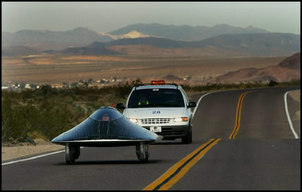 The closest that road vehicles currently come to this are the solar race cars – vehicles that have incredibly low Cd values (eg 0.1) matched with very low cross-sectional areas. These cars can travel at 100 km/h using only 1.5-2kW (2-2.7hp) of power. Even in normal road cars, the basic rules of having smooth surfaces with no abrupt transitions of shape, gentle front curves and long tapering tails continue to apply. When a car moves, air is deflected above, below and around it. The point at which the air splits to pass above or below the car (termed the stagnation point) is important in deciding how slippery the car will be. The lower the stagnation point, the better, because then less air runs into the (usually) rough underside of the car. However, unless the car has a front spoiler extending almost to the ground, air will pass under the car. This has caused some manufacturers to start adopting low drag undersides for their cars. There is also another reason for entraining this air into a smooth flow – creating less lift, which we’ll get to in a moment. The use of a radiator intake duct that retains attached airflow for at least most of its length will give the best flow with the least drag. Controlling the flow of air after it leaves the radiator core is also important. Ducting air out through the wheel wells is efficient, but even better is the ducting of the air out through the top of the bonnet. Many sports homologation versions of road cars have taken the approach, fitting special vents to flow radiator air out through the bonnet. However, care needs to be taken that this flow does not disrupt the attached flow across the upper surface of the bonnet. Air which is forced over the top of the car has to make its way from the relatively bluff nose area to the top of the bonnet, staying attached over the transition formed by the leading edge of the bonnet. This radius is critical. If this corner is too sharp, the air will separate from the car’s surface. A separation bubble will form on the bonnet, leading to the presence of turbulence at the front of the car. It is for this reason that most modern cars have very gentle transitions of shape in this area. 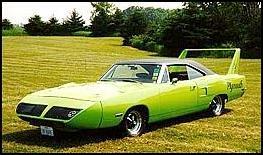 One of the all-time great aero specials – the 1970 Plymouth Roadrunner Superbird with its enormous rear wing – had a curved nosecone substituted for its normally bluff front. This extension prevented bonnet separation and also reduced the amount of air passing underneath the car. The radius formed by the transition from windscreen to roof is also vital. If this angle is too sharp, the airflow may not remain attached to the roof, causing turbulence and further problems towards the back of the car - it’s not much good having a rear wing placed in turbulent air! What happens at the back of the car is extremely important in determining total drag, rear axle lift and, to a more limited extent, front axle lift. In many cases, the flow at the back of the car is more important than the flow behaviour at the front. 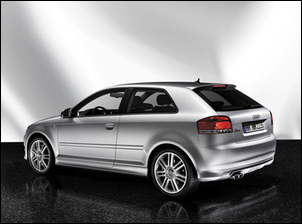 The pattern of airflow at the rear of the car depends very much on the type of car being examined. If the airflow from the roof is to remain attached down onto the boot, a three-box sedan must have a very shallow-angled rear window. It is very important that this flow does remain attached – the area of the wake will be reduced, dramatically lowering the car’s overall Cd. When the profile of a three-box sedan is compared with an ultimate teardrop shape, it can be seen that separation at the roof/rear window transition can easily occur. Cars with gently sloping rear windows – often hatchbacks or coupes – allow the airstream to remain attached right to the rear of the car, so producing only a small wake. The transitional curve between the roof and the hatch needs to be gentle if the airflow is to remain attached, and the angle of the hatch to the horizontal is also critical. It’s important to note that while it may look ‘obvious’ to the eye that the airflow remains attached across a coupe or hatchback’s rear, wool tuft testing needs to be carried out to prove this. Even quite minor changes in rear hatch angle can cause major changes in drag. Tests carried out by Volkswagen have shown that the Cd of the car can vary from 0.34 to 0.44 as a result of slight alterations to the rear hatch angle. At one angle (30 degrees to the horizontal in this case) the airflow separation point jumped back and forth from the end of the roof to the bottom of the hatch, depending upon the curvature at the rear edge of the roof. It was this 30 degree rear hatch angle that produced the highest Cd value. This sort of substantial change in the car’s drag coefficient will have a large influence on the car’s top speed and fuel consumption. In some cars even a 10 per cent reduction in drag will decrease open road fuel consumption by 5 per cent. 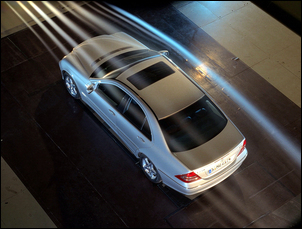 Cars with a near-vertical rear hatch have airflow separation that occurs at the end of the roof. This means that the wake is as large as the frontal cross sectional area of the car. People who locate spoilers half way down the rear hatch should realise that they are achieving nothing with this placement! A large wake is also present on most station wagon designs. 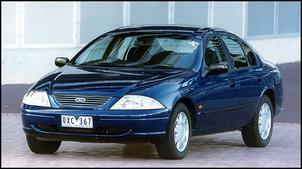 For example, the Cd of the AU Ford Falcon wagon is sedan is 0.341, versus the sedan’s 0.295. Airflow along the sides of the car is also important. The use of flush-mounted side glass is one approach that is taken to reduce the surface roughness; however, this is implemented more for noise reduction than for lowering drag. Rear vision mirrors have also changed in shape as their aerodynamic drag and the way in which they influence the behaviour of the airflow further down the side of the car is taken into account. Also very important is the plan view shape of the A and C pillars. Very curved pillars are used to encourage the flow of air from the windscreen smoothly around onto the side glass. On three box sedans, the greater the flow of air that can be gained from the sides of the car onto the boot lid, the better. This air can be used with aerodynamic aids such as spoilers, and its presence also helps fill that ‘hole’ in the air created by the car’s forward movement, thus lowering drag. A classic case of modification of the shape of a car to achieve laminar flow down its sides occurred way back with the design of the very first Volkswagen Kombi. Initially, the vehicle had an almost flat front and very sharp corners – a bit like a moving shoebox! In this form, severe turbulence occurred down each side of the vehicle and it had a Cd of 0.76. Slight rounding of the nose was then carried out, with special attention paid to smoothing the transition from the front to the sides of the vehicle. The Cd then dropped to just 0.42! As indicated previously, a car draws along a wake of disturbed air. The smaller this disturbance, the lower will be the drag. A very long tail which tapers in both height and width will cause the least drag – that teardrop shape again! While long, tapered tails aren’t practical in normal car design, a truncated version is often used. Cars using boat-tailing (a narrowing of the width of the rear when looked at in plan view) are common, with measured drag reductions of up to 13 percent achieved with this approach. 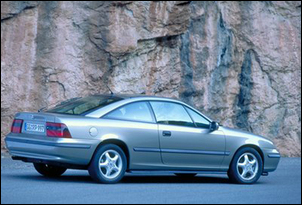 The Opel Calibra – still one of the all-time aero greats - decreased its Cd by 0.01 with a total rear boat-tailing of 130mm. 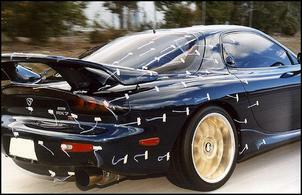 Cars with tails that taper in profile are also common, but often the taper is abruptly cut off. This is a called a Kamm tail. The flow of air over the car will create high and low pressure areas. Low pressure areas (creating lift and sometimes drag) occur most frequently where the airstream passes over an upper curved surface – the transition from grille to bonnet, windscreen to roof, and roof to rear window. The shape of the original Porsche 911 created very high lift coefficients - it’s a good example of where laminar airflow wraps around a long, upper-body curve. High pressure areas (creating downforce and sometimes drag) occur at the very front of the car, and in the transition from bonnet to the base of the windscreen. The way in which these pressures act will result in an overall lift coefficient, or Cl. The lift coefficient is normally expressed for both the front axle (Clf) and rear axle (Clr). A negative lift value (shown by a minus sign in front of the coefficient) indicates that downforce occurs – something relatively rare in a road car. The cabin ventilation inlets and outlets provide good clues as to the location of (respectively) high and low pressure areas. Intakes for the cabin ventilation system are almost always at the base of the windscreen, while outlet vents are placed in a range of areas. On most recent cars, the outlets are hidden behind the bumper bar in the low pressure wake, but in older cars, vents in the C-pillar or across the top of the rear window are used. While the location of these vents is not of direct use in modifying cars, looking at cars and thinking about the pressures present at these vent locations can be quite illuminating. The current automotive fashion is for manufacturers to pay only lip service to aerodynamics. In fact, there has been little improvement in CdA figures in the last decade. However, at highway speeds, most of the power being developed by the engine is being used to push air out of the way. For cars of the future to improve their open road fuel consumption, CdA figures will have to once again fall: it is simply a physical requirement of efficient car design.